Does the Bible Speak Definitively On the Age of the Earth? Albert Mohler: Theologian and defender of a Young Earth view of Creation. C. John Collins: Old Testament scholar and defender of an Old Earth view of Creation. I recently listened to a debate between Dr. Albert Mohler and Dr. C. John Collins, with the provocative title, “Genesis and the Age of the Earth: Does the Bible speak definitively on the age of the universe?” Christians have very different views on this topic, and sadly, a lot of debates of this sort tend to descend into either rancor, or simply talking past one another, particularly for debates with non-believers. But this debate, intended for an audience of Christian pastors, was different, and for that reason, I thought it worthwhile to make some notes and share them here on Veracity. You can view the debate yourself at the Trinity Evangelical Divinity School’s website, and I would encourage you to do so to get the most out of my following comments and observations (another synopsis of the debate is available here). 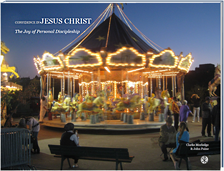 First-order debates: These debates are properly understood to be involving heresy, whereby certain doctrines are proposed that directly undercut or compromise the integrity of the Gospel. Such false teachings are to be rejected and are not to be taught in our churches. One example of this order is regarding those teachings that deny the Triune nature of God. Second-order debates: Other issues are considered to be important, in that the propagation of a controversial teaching could disrupt the integrity of the witness or discipline within a Christian community. However, such issues would not be properly considered as “heresy.” You can still have disagreements on second-order issues, and still consider other Christians with different views as genuine believers. But it would create unbearable problems to have such particular teachings promoted in a local church community. For example (in my mind), if a church has a commitment to only practice “believers’ baptism” (baptism for adults or older children only), it would be counter-productive to have a pastor teach on the importance of having infant baptism. This is not going to work out very well. Third-order debates: This last category includes those issues that are still of importance, and that may have an impact on other areas of church doctrine. Christians can and should discuss these matters, because of where compromise on an issue might take us, further down the road. But Christians with different views on issues of this order can still maintain active fellowship with one another. The age of the earth fits into this last order of theological issues. Drawing the line as to which issues fit into which order level can be tricky, but Al Mohler has listed some helpful categories. Though I probably would want to put some of Mohler’s second-order issues into the third-order camp, I appreciate the fact that Mohler does not see the age of the earth controversy within the church as a make-or-break fellowship issue. I know of at least a few Christians who would like to make this a second-order, or even a first-order issue, but in view of so many other pressing issues, such an elevation of this issue is unnecessarily divisive. That being said, Mohler does believe the age of the earth to be significant because of the implications he finds to be part and parcel with the discussion. The one particular implication that stood out to me is that Mohler believes that materialistic evolutionary philosophy, that denies the existence of a Creator God, often follows from a view of earth history that sees our planet as being very old. With respect to the history of science, Mohler has a point. It is difficult to conceive how Charles Darwin could have envisioned his theory of evolution, if there had been no acceptance of the great antiquity of the earth. 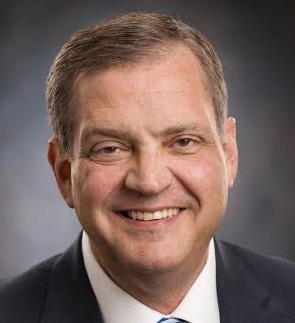 In defending a traditional view of earth history, as he considers to be taught in Genesis, Mohler believes the earth to be between 6,000 to 10,000 years old. If this interpretation is correct, then such a belief makes any subsequent belief in Darwinian evolution impossible. In my analysis of Mohler’s thought elsewhere on the Veracity blog, this effectively means that holding onto a Young Earth view acts as a type of “hedge” against the erosion of other Biblical teachings. In other words, the exact age of the earth is not the main issue here. Rather, the traditional view of a young earth keeps Christians from being tempted to embrace any notion of evolution as an alternative to Christian orthodoxy. In Mohler’s view, acceptance of Darwinian evolution, consistently held, can and does lead to a denial of the doctrine of the cosmic fall of humanity into sin, a cardinal doctrine of Christian faith. But what Mohler does at this point is very interesting. He admits that he is not a scientist. He is willing to accept that the philosophical principles that guide most scientists today do inevitably draw these scientists to conclude that the earth is old. The central philosophical principle at stake is that of uniformitarianism, which broadly speaking, assumes that what is true today, and that which can be demonstrated to be true in the future, is also true of the distant past. Mohler rejects such a uniformitarian view as being contrary to Scripture (though he does not offer specifics in this debate to support this assertion). In some sense, I find this a rather refreshing approach. Mohler does not get into frustratingly “scientific” disputes over the reliability or supposed unreliability of radiometric dating, postulating different ideas as to how stars millions of light years away from the earth can be reconciled with a young universe, or probably the most exasperating of all, the idea that “Satan put the bones of the dinosaurs into the ground in order to test our faith” (Yes, I have heard this one!). These type of discussions simply go nowhere fast, at best, raising doubts in the minds of confused believers, and fueling the fires of skepticism among the cynical. Also, they tend to create a wider chasm between thoughtful, seeking non-believers, who value the contributions of modern science, and those Christians who insist on a literal, six 24-hour days view of Creation. Though Mohler opts for the latter, he is not trying to argue science, as he is willing to accept the conclusions of modern science as logical products of a “deep time” paradigm. However, Mohler does not accept the philosophical assumptions made by that modern science. Instead, he holds to a view of earth’s young age, simply on the basis of how he understands the Biblical testimony. Mohler has no need for supposedly “scientific” arguments to support his view (though he is not necessarily opposed to those type of arguments, per se). The problem is that there is a lot of counterfactual evidence to dismiss by rejecting the scientific consensus for an old earth. Furthermore, the average Christian looks for evidence, anyway, to support their beliefs, so merely a theological or philosophical critique of uniformitarianism, in and of itself, is insufficient to drive away the threat posed by Darwinian evolution, that Mohler finds dangerous. Can You Reconcile Mohler’s Young Earth View With Other Passages from the Bible? Thus says the Lord: If I have not established my covenant with day and night and the fixed order of heaven and earth, then I will reject the offspring of Jacob and David my servant and will not choose one of his offspring to rule over the offspring of Abraham, Isaac, and Jacob (ESV). If God’s covenant with Israel can not be rejected, because of the unchanging fidelity of God’s character, it is difficult to imagine that the fixed laws of nature, that scientists works with everyday today, were somehow radically altered by this same God, sometime in the past. God’s moral character remains uniformitarian across time. Therefore, it is reasonable to conclude that the laws of nature are also uniformitarian across time. A caveat is in order, however. Affirming the unchanging character of the physical laws of nature, that God put in place in the beginning, does not rule out the possibility of miracles, that in rare circumstances, appear in history, according to the Bible. We must read the Bible as it was written in its original context. Traditional interpretations of Genesis can help to a certain degree, but a proper view of Genesis must be rooted in what the author originally had in mind to communicate. Collins assumes the author to be Moses, but Collins reminds us of several important observations, such as, that Moses and his original audience were Hebrew speakers and not English speakers, and that Moses was writing in a cultural setting that is different from ours in the 21st century. We simply can not assume that Moses had the same concerns that we do when we come to the text of Genesis. The Bible affirms that science, the human endeavor to grasp that which has been revealed by God through natural revelation, can give us genuine knowledge of the nature of how God created this world (though Collins does not go into details into this in this debate). Collins draws out evidence from the text itself to support his case as well, with two particulars argument that I found quite compelling. First, Collins observes that for the first six days of creation in Genesis 1, a specific ending refrain was mentioned, namely “evening and morning” (v. 5, 8, 13, 19, 23, and 31). However, on the last day, the seventh day, there is no end mentioned. In other words, we are still living in this last day. If we follow this traditional interpretation of the text, this would lead us to conclude that the current “day” we are living in is at least 6,000 years long, by the most conservative estimations… and still counting! When no bush of the field was yet in the land and no small plant of the field had yet sprung up—for the Lord God had not caused it to rain on the land, and there was no man to work the ground, and a mist was going up from the land and was watering the whole face of the ground—then the Lord God formed the man of dust from the ground and breathed into his nostrils the breath of life, and the man became a living creature. And the Lord God planted a garden in Eden, in the east, and there he put the man whom he had formed. (Genesis 2:5-8 ESV). Would we naturally read this activity, that of “day six” as taking place all within under a 24-hour span of time? Does a closer examination of the Ancient Near Eastern context of the Biblical writer give us a clearer understanding? For Collins, the reference to the planting of the garden must not be confused with the activity of another earlier day in the creation story, as there is no reason to assume that God had not created plants yet. Rather, this passage describes the transition from the dry season, where no plant is growing, to the wet, rainy season, when plants being to grow again, a common feature of Ancient Near Eastern ecology and agriculture. If this is indeed the case, then this “day six,” being commented and expanded upon in Genesis 2, is actually a period lasting through at least one climate cycle; that is, at least a year. Therefore, such a “day” can not be understood to be a literal 24-hour period, from a human point of view. The case of the “days” of Genesis 1, as must being interpreted as literal 24-hour periods, now stands on shaky grounds. However, if such a single “day” is one of “God’s working days,” not subject to constraints from a human perspective, lasting possibly an indefinite period from our point of view, then the difficulty of interpreting this passage is resolved. Nevertheless, C. John Collins draws the line when it comes to the historicity of Adam, which he defends. For Collins, Adam can not be simply metaphorical. Adam and Eve must be the biological parents of all subsequent humans, in order to sustain the doctrinal idea that Adam’s sin extends to all other human beings, a key teaching articulated by the Apostle Paul in Romans 5. Albert Mohler would agree with C. John Collins about the traditional theological importance of historical Adam. 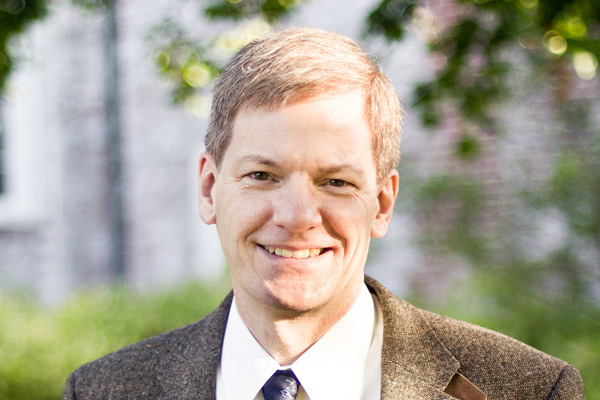 But Mohler would also contend that Collins’ departure from the traditional view of a young earth, regrettably opens “theological backdoor opportunities” for some, if not many, Christians to dismiss the traditionally orthodox teaching on the nature of human sin, because of this corrosive impact of evolutionary thinking. Collins’ response is that the practice of modern science, is conservative by its very character, and shuns away from making definitive pronouncements that can not be backed up with solid data. Collins understands that unfounded claims made by certain scientists have gained an inappropriate amount of influence in the culture, for sociological reasons, not scientific reasons. Essentially, many popular spokespersons for the sciences tend to speak outside of their specialized field, under sociological pressures, which ironically damages the integrity of the sciences, particularly in the minds of many Christians. By surrounding himself with the “hedge” of a young earth, Mohler makes the possible denial of particularly crucial details regarding historical Adam relatively remote. I can fully understand why Mohler’s argument might be appealing to many Christians, and it is theoretically possible that he indeed could be right, though the odds are not favorable at the moment. Yet as Collins suggests, building a higher “hedge,” or “wall” as he put it, to act as a fortress against the encroachment of the world, is simply not effective. The “hedge” that Mohler wishes to plant around the core doctrines of the faith is only as good as the roots that hold that hedge in place. As Collins has shown, it is not simply the conclusions of modern science that challenges the security of those roots. It is also the ancient, literary context of Genesis that leaves Mohler’s “hedge” as being vulnerable. For Collins, the crucial teachings of Scripture are not threatened by an admission of the ambiguity of the age of the earth, with respect to what the Bible teaches. Furthermore, why position the “hedge” with a young earth view of scientific history? Why not place the “hedge” farther back by affirming the premodern view of geocentrism? Mohler is concerned that the paradigm of “deep time” paves the way for Darwinian evolution. So why not question the philosophy that led to the development of “deep time” to begin with? If philosophers and natural observers had never “caved into” the demands of Galileo and Copernicus, that insisted that we can not take the instance of “the sun stood still,” in Joshua 10:13, as being literal, and positing instead a view of the earth moving around a relatively fixed sun, scientists probably never would have conceived of the idea of “deep time” to explain the observations of modern geology, astronomy, and other scientific disciplines. Albert Mohler is clearly a smart man, intellectually and theologically sophisticated, and I share his concerns about the loss of orthodox doctrine among some advocates of theistic evolution. A number of my Christian friends would agree with Albert Mohler’s view, or some variation of it. Yet though I respect and admire Albert Mohler’s position as a genuine possibility, C. John Collins made his case more effectively, in my mind, and therefore, was more persuasive.4 I could comment more on this debate, but I have written more extensively about these creation topics elsewhere on Veracity, actually dozens of posts that the interested reader can explore on their own. Nevertheless, Mohler’s and Collins’ dialogue sets a standard for civility and mutual understanding that I find quite rare and remarkable, so it is worth taking a look at. The debate lasts 2 hours and 14 minutes. This entry was posted on Saturday, February 11th, 2017 at 8:32 am	and tagged with albert mohler, c. john collins, creation, Creationism, Evolution, Evolutionary Creationism, Genesis, historical Adam, Old-Earth Creationism, Young-Earth Creationism and posted in Topics. You can follow any responses to this entry through the RSS 2.0 feed. I often wonder if the specious reasoning of some Christian leaders is the product of their accommodationism. You can’t have it both ways–on one hand trying to be a credible witness and on the other advocating foolishness. It is fideism to think as an adult when it comes to doctrine and theology, but as a lazy child when it comes to matters of reality. 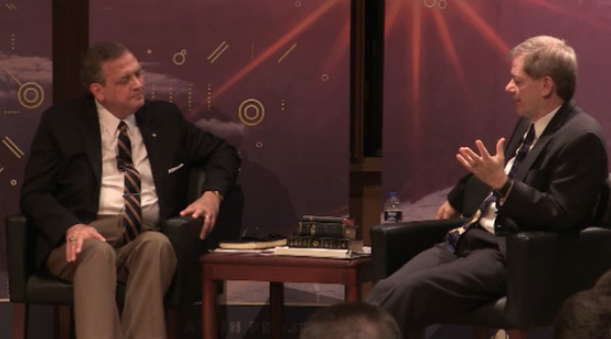 Al Mohler would do better to be silent on the matter than become a lightning rod for young earth creationism. The age of the earth is not a fundamental tenet of the Christian faith. However, it most certainly can be a major impediment to rational Christian witnessing. So while he gets credit for civility, he is selling a strange brew. My question is, “Does he need to?” Ultimately, it’s an ethical question.